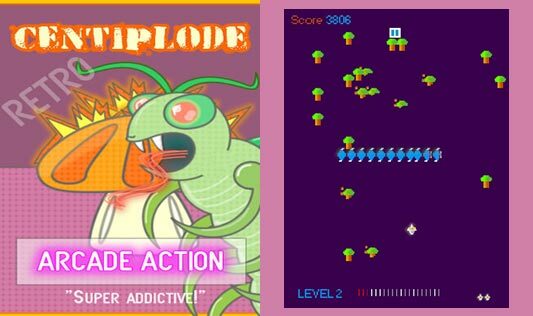 Home #ADDICTIVE Centiplode – Can you beat the retro garden beasties? 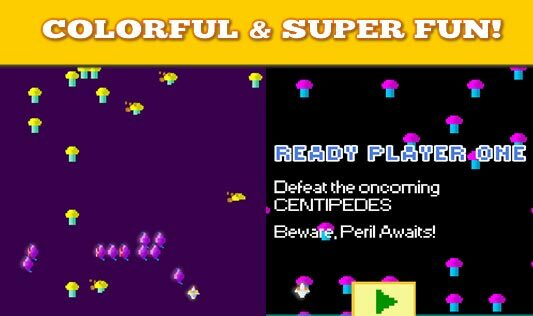 Centiplode – Can you beat the retro garden beasties? Growing up in the 80s was fabulous. We had great music, great films, questionable clothes… but also great video games! Nowadays retrogaming has become very popular and has also fallen into the long list of Hipster millennial trends. Retro consoles are shooting up in price and becoming harder and harder to obtain. Large video game corporations are releasing Pi-powered mini versions of their classic retro systems pre-loaded with the best sellers of the past. Here at Gazzapper Games, we wanted to bring back some of that glorious 80s retro feeling to mobile devices and bring back the short arcade bursts of ‘one-more-go’ gaming. Many mobile games are more about the graphics or the extreme grinding or using visual physics gimmicks and less and less about the ‘fun’. Remember that word? Above all we want our games to be fun! And arcade title Centiplode is meant to be fun and all about the gameplay. The game starts slowly with you firing through the garden mushrooms in order to hit the oncoming Centipede that is intent on devouring your player. The controls can be set up to fire automatically as you move your player around the screen or you can choose 2 finger mode allowing you to control your firing. A headshot cuts off the head of the centipede with a bang, you score extra points but another new head will replace it and it will continue on its way, weaving through the mushrooms. When the centipede encounters a mushroom it will advance downwards and reverse its direction. Parts of the pulverized centipede section will magically sprout a new mushroom from the ground immediately, thus giving you more cover from future centipedes. But the perils do not finish there, for while the centipede advances a terrible spider will emerge and erratically move about in and around the player’s area. Destroy the spider for an additional bonus before yet another spider joins the fight! Destroying too many mushrooms will cause a new insect to attack downward in a vertical line intermittently creating more magic mushrooms until it is satisfied that enough mushrooms exist and it will leave you alone for a short while. Later levels bring the dangers of the Scorpion, as it poisons the mushrooms and sends the centipede berserk and causes it to frantically attack your player at high speed! A new level starts with a new centipede after you eliminate the previous one. We are a small indie game studio from Dublin, Ireland. We develop and design our titles mainly using our own graphics and sound effects, although we outsource our game music production from time to time. We also published a fun book on “Retro Game Development” called the ZX Spectrum Games Code Club which is available to buy online. Follow Gazzapper Games on Facebook and Twitter for insight on future releases! This article was Published by Edamame Reviews, Written by Gazzapper Games.